Today i wanted to talk about something i don’t see many people doing anymore but i think that using heated rollers is amazing it can give the hair such amazing shape and texture not to mention i find curls tend to hold better in heated rollers than they do when curled with a wand or tong. Heated Rollers can give you such an amazing look and can be used in a ton of different ways to get different hairstyles with just 1 item! When you are using heated rollers on hair it will hold your style just perfectly although if you use plastic rollers on wet hair and allow them to dry you will get even longer lasting curls because wet sets always last longer than heated sets, I won’t go into the chemistry but you get the idea. 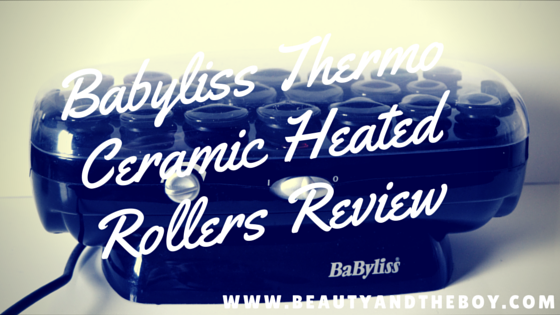 The Babyliss Thermo Ceramic Heated Rollers come in a set of 20 rollers in 3 different sizes for the different sections of your head, I tend to use big rollers on top and medium on the sides and the small ones in the bottom section/nape. What i really like about these is they have a material coating quite almost velvety which gives the hair an amazing shine, i also find it useful because you don’t burn your fingers like you would with regular heated rollers. The Babyliss Thermo Ceramic Heated Rollers don’t take much time to heat up at all depending on the temperature you can change with the dial to suit you it takes about 10 minutes to heat up properly. Also supplied with the rollers you get 9 “Super Clips” which hold the rollers but you dont get much of them so to make the numbers up you also get metal pins in 3 different sizes which hold the hair in place. I created these different looks below using the Babyliss Thermo Ceramic Heated Rollers my model had long hair which was a dream to work with but her hair was quite fine. I had to start by prepping the hair with some ghd Volume Foam by running it through damp hair and blow drying to get some volume into the hair then i applied some heat protectant because these are a heated tool after all. Put the rollers in and let them set until they were totally cool which is really important or your curl won’t hold. When taking the rollers out make sure you twist to create a curl instead of just pulling them out, shake your hair out to separate the curls and take a natural bristle brush through your hair this will further separate the curls and to finish tip your head forward and apply a tiny bit of a lightweight paste/pomade to the ends of the curls by scrunching and releasing and repeating this is a great way to get volume in your curls and to finish spray with hairspray scrunch and you’re done. I really love these rollers because they dont give the hair tangles and they create this gorgeous shine and not to mention they are really affordable. Do you use Heated Rollers? What looks do you like doing best? I have a slightly different version with plastic ridges rather than felt, they’re great but I have too much hair for a single set to work well. I wish I could buy extra ones to pop into the unit to heat whilst I’m putting the first set in! Nice look, your hair is so beautiful.